For Video work: Check out the Tokina 11-16mm lens on DSLR + slider. Just came across a vid exploring the potential uses of the now infamous Tokina 11-16mm super-wide lens which, on an APS-C cropped sensor like the Canon EOS 550D (T2i), 60D or 7D, coupled with the use of a good slider, will render some incredible shots. Just set the video cam on manual exposure, select an appropriate ISO (usually ISO 100 if outside and sunny), perhaps 720p and 60fps is good (and what the following vid is shot in) but played back at only 24/25/30fps. This was shot with a Tokina 11-16mm, Canon EOS 550D body with APS-C sensor (1.6) and a Konova slider unit. FYI: This lens retails for around $550-$600. Very different from straight still photography lenses which tend to be things like 24-70mm or 24-105mm - seems like with film the best lenses are the straight out 50mm f/1.2 (or at least the 50mm f/1.8 for only $150) and a wide angle like 11-16mm and perhaps a macro lens and that's it! Cool lens but no stabiliser makes me sadface. Need a slider to make it look good. Also being limited to either a 50mm or a super wide angle isn't really good. The flexability of the 24 - 105 L series in filming is still worth the extra few hundred bucks. Nice find though I guess it all depends what you usually film. Very true. One of the big issues with DSLR as video is the (almost) complete lack of good IS, unlike professional video gear. However the tradeoffs of awesome bokeh and low light shooting are great. At such a wide angle with a steady hand you can kinda get away without image stabilisation. But of course for a zoomed in telephoto that would be a nightmare so it is definitely what you want to shoot depends on the lens choices. I find that for photography you can't go past 24-105 when you've got a flash and you're holding the camera body freehand. With film, however, the slowness of the lens at f4.0 just makes it semi-useful for the stuff I am trying to get into since the IS isn't even an issue when using a tripod or steady rig. Only downer with the 24-105 for me and why I'm not getting one (going a 24-70 if anything) is it's one stop slower than a 24-70. The f-stop of 2.8 vs 4.0 matters more to me for what I need lighting wise. For my type of stuff the extra low-light and extra bokeh potential is more than an extra 35mm of reach but I've seen spectacular results on both. Also, the 50mm f1.2 is actually more expensive than the 24-105! and at f1.2 you can shoot at midnight with the illumination of an iphone and it'll still pick it up *mouth waters*. Been going through the lens choices from Vincent Laforet - after seeing his short film Reverie on a prototype EOS 5D Mk II. Basically turned the film industry on it's head. 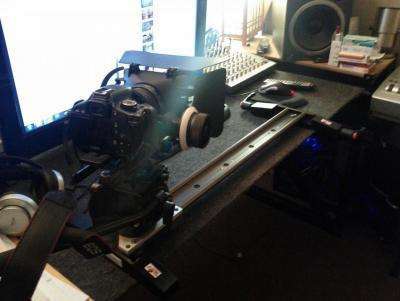 Canon 10-22mm on a .75m Glidetrack, fluidhead and matte box, fogta dp500 follow focus and rails system. Tamron are bringing out a 24-70IS so that will be interesting. Not sure when it comes out. I just shot my first full day of shooting video for a client. Was a winter/hair catalog fashion shoot. Had a 0.75m glide-track, 50mm f1.4 prime, canon 10-22mm loaded up on the glidetrack with the rig you see in the above pic. I will post up one glide track example and one 50mm f1.4 example. Both were recorded at 50fps and slowed down to 24fps with a shutter speed of somewhere around the 250-280 degree range (so that when it's played back at 24fps it looks more natural). My role was to place as much emphasis on the hair as possible so I used a lot of the natural light and moved around the models until I got that shimmer and specular highlight around the edges. The glidetrack was kind of wasted because the 10-22 wasn't very fast and had trouble seeing indoors without a ridiculous iso. I used it where I could but the real winner was the 50mm f1.4. No wonder everyone uses them for making music videos and for such a cheap lens at 50mm they outclass a 24-70 (set to 50mm of course) in sharpness due and the massive aperture advantage for low light is killer. ^ thats excellent work Bouy!!! should be proud of that. What was the shoot for? Thanks Siddr20 - it was for the Christopher Hanna Platinum hair salon chain - their winter season curls / products / girl stuff that i have no idea about lol. Any behind the scene shots of the lighting setups etc? All they used is what you saw in the vid. Nothing much changed except perhaps the reflector boards (They used reflector boards on the left and right sides. These boards have a white side and a black side.) which were flipped around or adjusted slightly. I was surprised they didn't use a reflector mat along the floor to give that nice sheen and more even skin tone under the jaw around the neck area, but anyway that was it. Hmmm.. seems like a pretty cool lens! Still tossing up if I get a wide angle / fisheye or a 70-200mm next. Does this lens work with full frame cameras? Talking about the 24-105 L, I bought it a month or so ago for my 5D Mark II for film making and have loved the hell out of it! The zoom range on it is great, 24 is pretty wide for a full frame sensor and it's nice to have that little bit of reach over the 70 at the top end. The 24-70 again is a great lens and I can see the 2.8 being really helpful, especially in low light but I'm on a really shoe string budget and don't have much money to spend. I'd rather buy 1 quality lens than a couple of cheaper ones, and thats why I went with the 24-105. It will probably be a while until I will be able to afford another L Series lens so I was looking for something that covers a wider zoom range with a reasonable aperture for the time. Either way, when you buy an L Series lens, your buying a quality piece of glass you won't be disappointed with! Yeah even though film and photogrpahy tend to go off in quite different directions they have a pretty decent overlap of techniques and lenses. The L-Series is just stellar for photography. For a full-frame, the 10-22 from Canon and the Tokina 11-16mm both support full frame and you'll get an even wider angle from it. They are also both rectilinear lenses (opposite of the curvilinear fisheye) so makes shot sof bulidings or architecture or anything with straight lines like poles, trees, horizons, lakes, etc very nice. I tried getting a 0.43x wide-angle for my 50mm f1.4 to give it a bit more width but the lens adapter is shocking and it just doesn't work. So soft around the outside and not even wide enough for curving to be a problem but I take the adapter off and everything just clears up. Full frame is definitely preferred... and there is no way around it, for ultra wide angle I will need to fork out the money for a wide-angle lens. I plan to do things like company / business profile videos and house showcases so in both of those if you plan to take a shot with more than half a wall and 1 corner in the picture you'd need an ultra-wide angle. 5D Mk II with Tokina 11-16 would be stellar in that regard... but that's around $2.5k worth of additional investment I'm not yet willing to spend lol!!! might have to rent those things if and when those first few job opportunities present themselves. I use the tokina 11-16 primarily as a glidecam lens with a 550d. I rarely use it on 5dIII, but on a full frame, you can only use it at 16mm focal, so it is basically a fast 16mm ultra wide prime. DSLR' video rarely 'need' IS glass. Our set shoots with RED etc, dont require IS. Even with weddings etc IS is not necessary... would be handy though! Perhaps for sporting events and drifting with a zoom IS is beneficial. The tokina is well known as one of the sharpest 11-16 wides, its a well nice lens for photo and videog. If you are into film, forget about EFS lenses, M42 vintage primes are the go. Pentax SuperTaks in particular. 35mmf2, 50 f1.4, 55f1.8 have superior prime optics and range from $40-100 for GOOD examples for vintage primes. Then you obvsiously can go up to Zeiss Jena, Nikkor vintage etc..
Heres a recap shoot using the tokina 11-16, 550d and konova slider for the A cam angle. For a lens like this one it's completely different. No need for IS on a lens that is so wide. But for example, we shot some footage today for Metal Mulisha's upcoming DVD and there was no way I could do that and keep it so steady without IS. Again it's different applications, plenty of times I was on 105mm so thats a different story. Cool lens though for sure!